Bornholm, a small Danish island in the Baltic Sea. Called sometimes the “Majors of the North” or “Pearl of the Baltic”. We have heard many stories about Bornholm. Among them were those who said that it’s the best place for cyclists ever. We decided to check it out! At the end of July 2016 we went on our first bicycle tour. We drove in three: Philip (dad), Chris (9 y.o) and Agatha (6 y.o). We had only bikes with panniers and a bicycle trailer. On Bornholm bike is the main way of travel. Distances here are so small that it is best to move around that way. Bornholmans have a great road infrastructure well prepared for cyclists needs. 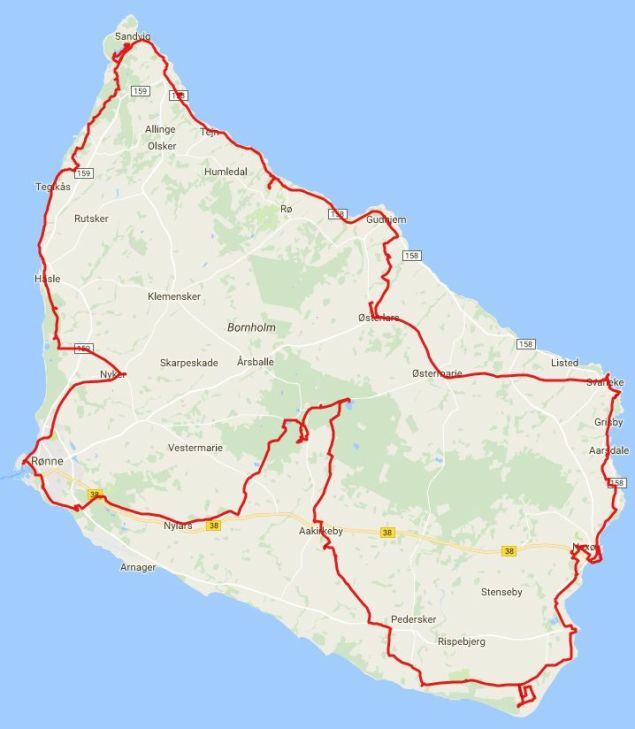 How to get to Bornholm from Poland? Jantar catamaran, which is operating on the route Kołobrzeg-Nexø. This is a small ship that we had the opportunity to see when it hit the port of Nexø (on 4th day of our trip). Unfortunately, it’s badly held and is uncertain. The crew can cancel the cruise due to bad weather at sea without informing the passengers. When there is a strong wind in the sea, it rocks a lot. It’s for those who don’t have seasickness and thrills. We did not use his services because we did not want to alienate children to shipping. Rønne-Ystad ferry. But how, through Sweden? You can. In this case, it is a little expensive, but we use two ferry connections: Swinoujscie-Ystad and Ystad-Rønne. This is an option for people who like to sleep on board. Travel time by boat: 6h + 1.5h. And unfortunately it’s quite expensive option. Rønne-Sassnitz ferry. This connection from Germany lasts 3.5 hour. And the price? Cheaper than from Kołobrzeg. It’s because of kids who have a cruise for free (there is only a fee for their bicycles). However we need to get to the island of Rügen, preferably by car. Hmm, don’t ask us twice. We chose this option! By the way, it was great opportunity to explore a some parts of Rügen island. Within 6 days we have traveled 160 km of beautiful cycling routes. We drove around the island clockwise from Rønne. We managed to see many attractions and spend great time on camping. During the day most of the time we rode on bicycles, but we were not tired. We divided the route into 6 episodes. One for each day. Daily route was “from the campsite to the campsite” with visiting interesting places on the way. Detailed route plan is given below. We had a tourist gas cooker and a burner. At the campgrounds there was access to gas, but on the route it was very useful. Besides dinner we also had a set of “helpers” ie bars and other sweets. In addition to breakfast we took tortillas (as a substitute of bread) and some cover. We even tempted for a tuna salad, which was enough for the first 2 days. During the tour the only thing we bought on a regular basis was water and fruits (mainly bananas). Sometimes also some local delicacies. During our trip we recorded about 1,5h of vlogs. We encourage you to watch our videos. In the movie we show the course of our expedition. You can see how traffic and bike roads looks like. There is also a shortage of shopping in the shops and sightseeing attractions. Videos you can find on our Youtube channel. If you like it, we invite you to subscribe to the channel – this way you will receive notifications of our next adventures. Direct link to all Bornholm videos: here. If you don’t have time to watch all episodes, we’ve prepared short summary version of our trip – 7 days in 7 minutes.